To say Soft Machine are underrated would be an overstatement. Their arcane line-up history can distract us from their stature and influence as arbiters of that dread phrase jazz fusion. Founded in 1966 by Robert Wyatt (drums, vocals), Daevid Allen (guitar), Kevin Ayers (bass, vocals) and Mike Ratledge (organ), in the '70s under the aegis of keyboard player Karl Jenkins and guitarist John Etheridge the band continued to refine its fusion of jazz and rock. By their tenth studio album in 1981 there were no original members. Since 1999, the band has been known as Soft Ware, Soft Works and Soft Machine Legacy. 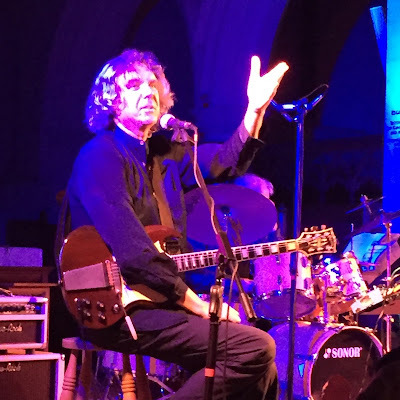 John Etheridge admits that Legacy wasn’t a great name - they kept getting mistaken for a tribute act! In 2015 they reverted to Soft Machine. With three members who had been in since the '70s it seems a reasonable decision philosophically, and in action they seem perfectly at ease with embracing the whole history of Soft Machine in a coherent vision, ranging from the wiggy eccentricity of the earliest work to the compositional impetus of Karl Jenkins era and the broadness and sweep of Etheridge's Legacy period from 2004. Drummer John Marshall joined in 1971 as the band’s sound developed towards jazz fusion. Bass player Roy Babbington replaced Hugh Hopper twice, first in 1973 and, having left in 1976, again in 2009. As a rhythm section they are as rocking as they come, with tight discipline variegated by the restless colorations of jazz. Theo Travis, the “newcomer”, has in fact been in the band for over a decade, taking over from sax player Elton Dean who died in 2006. Travis has played with Gong and made albums with Robert Fripp. His improvisational chops and interesting electronic texturing are key elements in the sound. Versatile guitarist John Etheridge has had long collaborations with names as big as Stéphane Grappelli and John Williams. He has played with everyone. I interviewed him recently for an article soon to be published in Jazzwise online (also listen to our 2014 podcast interview about Soft Machine), and he was wonderfully warm, fun, voluble about the music scene in the ‘60s and full of stories - like how Soft Machine got kicked out of Romania. Voyage Beyond Sevens from their most recent album, Burden of Proof, is a Theo Travis tune that elegantly captures and unifies the wiggy airiness of early Soft Machine and the more advanced compositional impetus of the work from the late '70s. The Tale of Taliesin, from 1976’s Softs, is a mysterious, suite-like journey that contrasts with In The Back Room, based around a clunky funk riff extending into ensemble playing with Theo Travis on sax, some bulky bass-work and John Etheridge’s exciting soloing seasoned with Abercrombie-esque outside-playing. Song of Aeolus is a deep blues with emotional depths rarely mined so devastatingly elsewhere in the band’s catalogue, even measured against Robert Wyatt’s characteristically vulnerable contribution to the earliest albums. They play two selections from Third, the 1970 double that is Soft Machine’s most popular album. Hugh Hopper’s Facelift and Ratledge’s Out-Bloody-Rageous at times occupy a static space with a '60s vibe. These are the most ‘out there’ in a sonic and spatially expansive sense. It’s interesting to compare the comparative slenderness of the earlier thematic and musical material compared to the more proggy and involved compositions of later. The early Soft Machine albums tend to reflect the enthusiastically rough-hewn, free-forming whimsy of the ‘60s zeitgeist. They’re not really overrated except by comparison to the underrated albums made after the founding members had gone. It’s a shame because there are great compositions, great playing on both composed and improvised material, and great diversity in style and composition from jams to delicately composed vignettes like Out of Season, a “deceptively simple” Karl Jenkins tune which has been described as “a perfect melody”. Soft Machine’s tour is taking them to all corners of the UK from Derby to Kinross, with dates at the Borderline in London and the Cambridge Jazz Festival. “Twelve dates in a month,” Etheridge said to me, “I think that’s a tour. Of course back in the day it used to be 12 in a week.” On this second night of the tour he tells the crowd, cracking up with typical amusement: “It’s been a wonderful gig. We were much better than we were last night!” Even after all this time, Soft Machine are still out-bloody-rageous. A sampler, MoonJune Years 2002-2017, has just been released. Love John Etheridge - such a nice man and a fantastic musician!